A Houston based company, KeyCaptureEnergy is but one of many international companies engaged in this technology. It is at or near competitiveness with the peaker Gas Fired generators. I see residential storage as a method to artificially extending the daylight hours, if you have a large array, and overproduce. Additionally, being an EV guy, I am exploring the recommended practice with smaller lithium batteries. The recomended practice is to monitor the health of the cells in a Li pack. And actively monitoring the cell voltage and temperature. Monitor the cell voltage beacuse over discharging the cells, or over charging the cells is a bad thing. Do not want them too overheat and let the smoke out. To monitor the cell voltage, one has to develop a printed circuit, that is isolated and transmits the voltage and temperature to a central microcontroller. The isolation is accomplished thru optoisolators. The transmission process can either be parallel or serially. There are several formats of data transmission. To avoid cell damage, either a person stops the process of over-charging or over-discharging that battery pack, or it is automatic, and built in to the microcontriller. The former is called a Battery Monitoring System, and the latter is called a Battery Management System. A good source of information about available Battery Management Systems is Here. The path I have taken (and I am not an expert) is to build a parallel Battery Monitoring System. 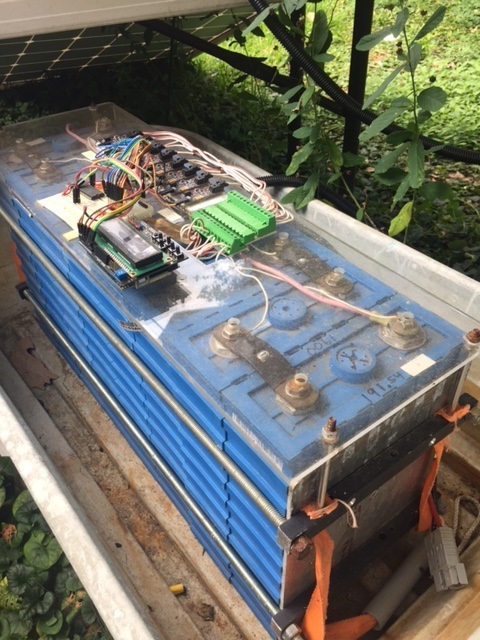 In the below picture, 8 each of a 160 amp hour cell are connected in series. This is a nominal 24 volt system, storing 24 volt x 160 ah = 3840 watt hour. Battery management is to follow with a circuit board that includes a resistor to dissipate energy during the charge cycle. Each cell is monitored, and the data is sent to a master microcontroller (Arduino UNO). The cell boards were developed by Cyclotronics.